What are the trending competitive games? What discipline to follow? 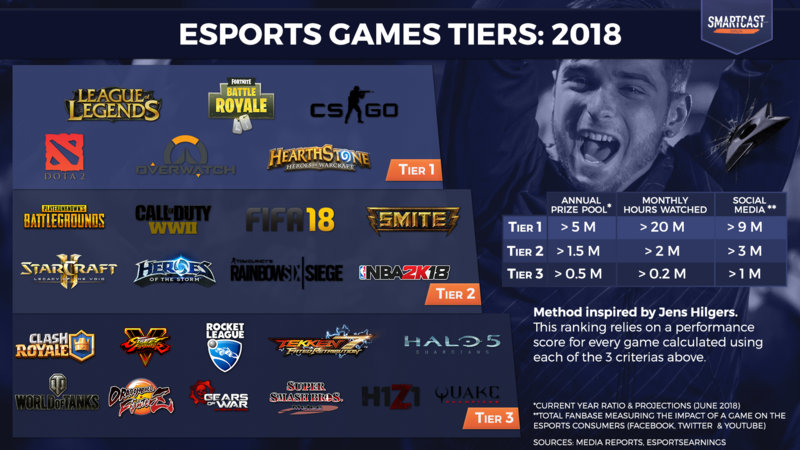 Back in 2016, Jens Hilgers, Bitkraft’s CEO, created the “Games Tier List”, to establish a ranking of all the hyped games played professionally. Three criterias were then used: the number of users, the viewership, and the cashprize displayed by each game. For two years, esports never ceased to transform. According to Twitchmetrics, in 2017, Twitch users spent 5,9 billion hours watching content on the streaming platform. It represents a 21% growth when compared to the previous year. The battle royale genre also exploded, along with the franchised system adopted by the major leagues. Many changes that gave the esports landscape a totally different shape. Here’s why today, Smartcast will try to update this ranking as accurately as possible. Being unable to get our hands on the number of monthly active users, we chose to replace this data by an overall estimation of each games’ fanbase according to their social medias followers. Although not perfect in a lot of ways, this data allows us to measure the impact of a game and its potential of influence. Better than nothing! Epic Games’ battle royale takes it all. In just a few months, Fortnite showed itself to be an example to follow. In terms of viewership, viewers have watched more than 100 million hours of the game each month. Is Fortnite ready for esports? When many people still do criticize its gameplay, Epic Games announced a cashprize worth of 100 million dollars along with a competitive championship. Something that has never been seen before! To give readers an idea, the total cashprize of 2017 for all games reached 113 million dollars. The message seems clear: Fortnite will be a major actor in the esports world. Ubisoft’s tactical shooter ensures a safe spot in the esports landscape, after entering the ranking in 2017. Offering an original alternative to CS:GO, the editor is developing an interesting economic model. In only a one-year span, Rainbow Six saw its viewership double, along with its cashprize. Originally the game that started the battle royale hype, many thought that H1Z1 would become an esports essential. At the moment, players are nonetheless slowly quitting the Daybreak Game Company title. Facing Fortnite and PUBG is hard and keeping up the pace looks awfully difficult. H1Z1 seems about to disappear from our ranking. Our data sources show how people are consuming esports here in the West. We overlooked viewership from platforms like VQ, Douyu.TV or Weibo, very popular in Asia and Eastern Europe. Those projections tend to demonstrate a certain stability of the esports scene despite the major growth that is currently going on. Even though viewership and cashprizes kept on growing for the last years, we can overall find the same licenses. In two years, only three games have gone out of the ranking. Moreover, PC seems to still be the most liked and the most popular support for competitive esports. Gaming pursues its own rhythm development.